Every christmas my family does a "secret santa" with all of the cousins, aunts, and uncles, which ends up being about 20 people. I had my Aunt and knew that I wanted to knit her something but I had a hard time thinking of what that could be. I decided to make her a tea cosy! Which didn't fit a lot of pots... so I also ended up getting her a teapot to fit the cosy, haha. 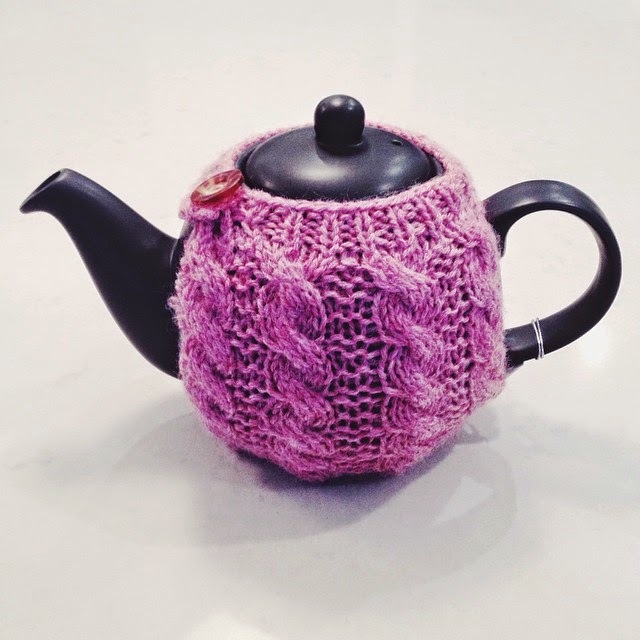 Now I'm here to tell you about how to make this tea cosy and what sized pot it goes with! I've made a similar cosy in the past but with different yarn and different sized needles. Using this pattern as my guide I changed it based on yarn, needle size, and how big I thought it should be. These are the results. Now you've completed one cable! Good job. To assemble attach the bottoms with your tapestry needle, and add the button to the top. Put it on your teapot and admire your work!